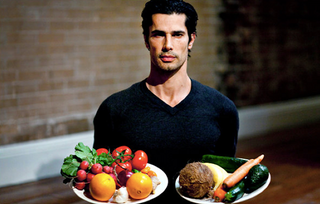 Yogi Cameron is a model-turned-Ayurvedic-guru. In his former life, he was best known as the dude toiling in Madonna's "Express Yourself" video. He shows all signs of being absurd. This kind of thing — plus a stint in Ellen DeGeneres' guesthouse and a habit of sipping straight ghee — aside, his approach, according to the Times, seems straightforward enough: a mix of ayurvedic philosophies, yoga, and surprisingly down-to-Earth instructions about eating slowly. It confirms our deeply-held suspicion that pseudonyms and aphorisms are really half the battle, Hollywood-guru-wise. And really, who can argue with a man who writes of clarified butter, "A life without Ghee is no life at all!"